California Clubhouse Opens For Membership Enrollment! After Wednesday, California Clubhouse will be open Monday-Friday, 10:00am- 2:00pm. Tours will be available Monday, Wednesday, and Fridays. After a tour, Orientations can be scheduled: Tuesdays 11-12pm and Wednesdays 1-2pm. California Clubhouse Hires Executive Director! We’re thrilled to announce the hiring of our Executive Director! Erica Horn has accepted the position and will start April 23. Erica brings tremendous knowledge and energy to our program. For the past 10 years she has been at HERO House–a Clubhouse in Bellevue, WA which she launched and built, in collaboration with a strong board and community. Prior to that she was at Evergreen Clubhouse for five years, and has worked for 11 years on the Clubhouse International faculty, accrediting Clubhouse programs across the globe. Erica is highly regarded throughout the Clubhouse International community, having achieved accreditation for Hero House in record time, and for achieving financial sustainability even as other Clubhouses struggled during the financial downturn. Erica grew up in the Bay Area and is enthusiastic about returning to her family and connections here. She is an exceptional leader and we are extremely fortunate to have her join the team. We received a grant from Sutter Health Mills Peninsula Health Services that will help us develop our information system to gather data, report outcomes, track progress and serve members. We very much appreciate the support from our local hospital. Thank you again Mills Peninsula! Clubhouse International leaders came in February to see California Clubhouse and talked to an impromptu gathering about how Clubhouses are succeeding worldwide. They had praise for our committed working group and our extensive achievements to date. Congratulations to all who have helped us get here. If you’re interested in this position, or know someone who might be, please have a look at the job description. We will have openings for a Program Director and Staff Generalist as well. Beyond Our First Hundred Days! As you can see below, we’ve pushed hard through our first 100 days since moving into Palm Avenue and have much to show for the effort including office furniture and computers (both donated! ), a consultant on-board who has years of Clubhouse experience, an active board, great community support, and last but far from least, both private and county funding. See below what we accomplished in the first 100 days of being in our Palm Ave. location! We’re On The Last Mile And Need Your Donation! With the County’s endorsement and approved Measure A funding (see Week 13), plus tremendous support and effort from our donors, working group and community at large, we are on the brink of opening our doors to members with a fully functioning Standards-based Clubhouse within the first quarter of 2015! Donations now will tip the scales and we’re reaching out! DONATE Today! — California Clubhouse Board of Directors. After meetings with members of the Board of Supervisors and the County Manager, California Clubhouse Measure A funding was approved to support California Clubhouse’s start up phase. Ruth and Juliana attended the National Conference. It was productive in its networking opportunities, increased understanding of basic Clubhouse concepts, and getting up-to-date with current Clubhouse practice and direction. Our Great Team Took Action! We were at the MHSA Public Comment meeting today. Clubhouse people spoke in person to the committee and our letters were read. We caught their attention. Clubhouse has been heard! We’ve been growing, changing, and moving fast. We’re making sure our collateral stays with us. Clubhouse Focus is on Outreach. We’re reaching out to everyone — individuals, families, service providers, business, political activists, all nationalities — so people can join in supporting our community building effort. See below and write for our MHSA email campaign. Help us meet with people interested in joining Clubhouse plus service partners, future funders and volunteers! 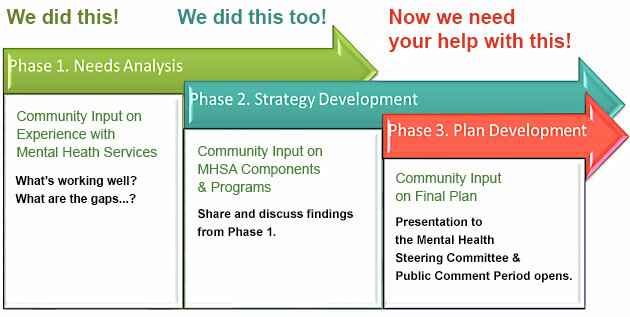 The Clubhouse social-vocational concept reached the top of the MHSA priority list for new projects to receive funding. Clubhouse goes into action! Clubhouse is working to receive MHSA funding. Please help us now. Write an email to MHSA @mhsasmc.gov and let them know you want a clubhouse in San Mateo County. Attend the November 5 Public meeting at 3pm and be counted. Mentor Clubhouse Comes to San Mateo! Members and staff from mentor, Putnam Clubhouse, visited San Mateo. Putnam has and will continue to provide ideas, best practices and the benefits and resources of their seven years in Concord. Happy Birthday this October Putnam! First San Mateo Foundation Grant Comes Through! Thank you Atkinson Foundation for supporting us. We will make you proud! Ruth, Juliana and Randi Knight, Clubhouse Advisory Board, hold up the check. While pre-launching with interim leadership, the search is on for a permanent director. We started with paper cutouts to position our work units: Education, Employment, Outreach, Welcome, etc. We got beautiful office furniture donated (thank you Roy Bukstein) and moved in to end week 2.
our Clubhouse consultant on board! We have a location. We are pre-launching. Ruth Parson, Clubhouse consultant, is helping to establish our Clubhouse. We are open by appointment and welcome people to call to help. A busy 5 months – too busy to update the timeline, including getting our location and preparing for our first 100 days campaign above! Donations from the first three months of the year have brought us to the $75,000 mark. Bi-monthly meetings drew record number of community participants and a larger meeting space was secured in downtown San Mateo. Particularly encouraging, several mental health consumers hoping to become Clubhouse Members are now actively involved in the start-up group. We began the transition from an interim board of directors to the identification and development of our first full-scale Board. A limited fundraising campaign raised $50,000 in just a few short weeks! We received our 501(c) (3) non-profit status! In time to fundraise in 2013! Generous donated services of a copy writer and designer helped us kick-off our fundraising drive with a beautifully informative brochure. Two people attended the 17th annual Clubhouse International Seminar in St. Louis, a celebration of the extraordinary worldwide expansion of the Clubhouse movement. We applied for 501(c) (3) non-profit status, using pro bono legal services. The NAMI San Mateo County gave their endorsement of California Clubhouse at their July 24th General Meeting. This was our first public presentation and the enthusiastic response confirmed the community’s desire to find a viable solution to unmet needs. Four people attended the New Clubhouse Development Training at Carriage House in Fort Wayne, Indiana for an intensive training on principles, policies, and best practices. California Clubhouse had its first informational meeting with presenters from our local mentor, Putnam Clubhouse in Concord, CA. 20-plus community stakeholders attended and we were able to form our Start-up group. We incorporated, using pro bono legal services later that month. We received our first grant of $5,000 from the Marx-Stark Family Foundation.